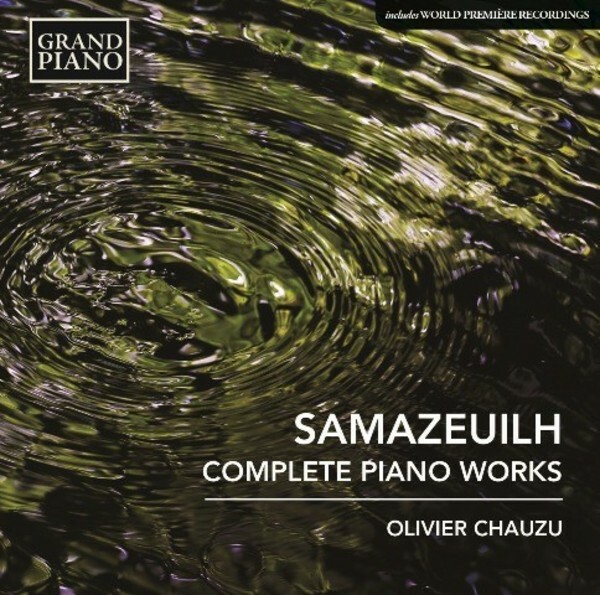 A pupil of Dukas and a lifelong friend of Ravel, the composer, pianist and critic Gustave Samazeuilh was a central figure in Parisian musical life over many decades. His skill as a pianist can be heard in the majestic colours and intense virtuosity of Le Chant de la mer (The song of the sea). From the Classical discipline of the Suite en sol (Suite in G) to the later Nocturne (the composer�s transcription of his symphonic poem Nuit), and Quatre Esquisses (Four Sketches), Samazeuilh�s voice emerges as one of remarkable originality and superb musical realisation. A prizewinner in Barcelona�s 1989 Maria Canals International competition, Olivier Chauzu trained at the Conservatoire National Sup�rieur de Musique in Paris, where he obtained First Prize for Piano followed by First Prize in Chamber Music, studying under Gabriel Tacchino, Th�odore Paraschivesko, Jean-Claude Pennetier and Gy�rgy Seb�k. He was also a pupil of Leon Fleisher, Vitaly Margoulis and Dimitri Bashkirov before further studies at the Banff School of Fine Arts in Alberta, Canada. His recordings of Isaac Alb�niz�s Iberia, Paul Dukas� complete piano works and selected piano pieces by Schumann and Beethoven have all received critical acclaim.